No! We’re still here! Seriously! New page and everything! Hato: We’re back again for another round of Left to Right (click here for the previous comic)! The New Blood, as you may have guessed! We’ll finally introduce the new faces around here and see the fabled Metanorn initiation! Enjoy the page and we’ll talk after the jump (Click the image for a bigger picture!)! Hato: We’re still not sure if those contracts were real or not. Hrmmm. In any case, LtR is still here! If you’ve been following Junko on DA, you’ll have noticed a few color versions of some of the characters going up, showing we’re still on this. We’ve been working on a big story arc as well as finalizing designs (on top of real life work!) so we’re glad we can finally get this page out. I mean, I can only help so much with the art (I can’t help with the art at all) so Junko has to motor on and do it all herself. And she’s doing it amazingly, might I add. 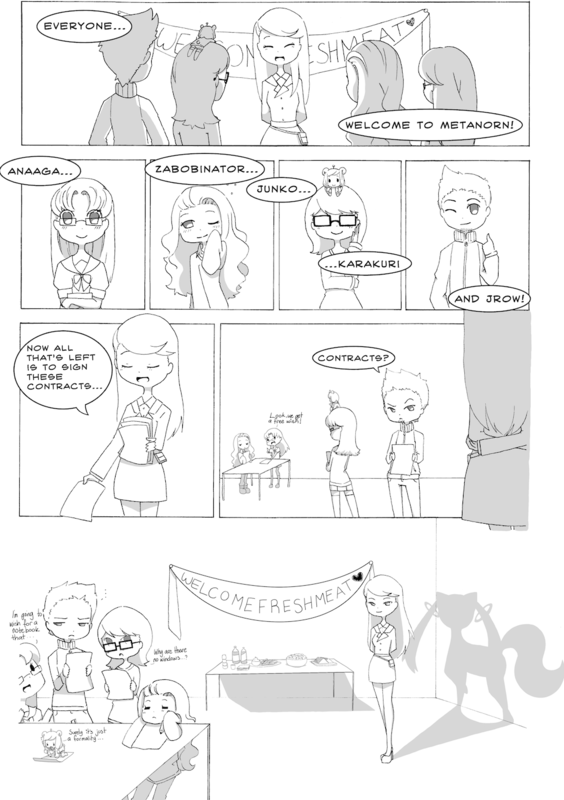 Hato: So if you want more LtR arty goodness, head over to Junko’s DA and keep locked on Metanorn! We’re brewing something big. And I’m preeeeeetty sure you’re gonna know what happens. Glad to know you’re one-step ahead of readers IMMEDIATE RAISED SUSPICION. There’s always more to come. We still got a few characters to do, I think. Well, Junko does. I just look cool. I wish I knew what he did too.. Thanks for the beautiful art, Junko! I would thank Hato too but I have no idea what the hell he does LOL. That’s about all, thinking about it. Basically, he’s the host for LtR like in MetaVerse. Right? Don’t try to make it look like he actually does anything! Well, he types the head intro right? …So then he’s moral support…? Uwah~ Everything looks so pretty! Awesome job! Woooooooooooo! This is awesome Junko and Hato keep up the good work! LOL @ Kyuubey shadow a nice and fitting touch! What’s it like having Junko hanging out on the top of your head? Pretty damn awesome. I help her see over things and she helps me cheat at cards xD. *o* This is really amazing. I love the Kyuubey thing. So Kyokai’s gonna turn into Kyuubei and torture them with ‘love’? Another great episode of LtR. Nice, Junko. Great designs for the MetaCasts. Can you NOT make Hato so cool. He’s currently bragging about his ‘coolness’. BEST site I've found whilst brainlessly searching the net!! id appreciate if you gave more pages though. like 4 pages at least? I knew it! Kyokai is secretly Kyuubey. No wonder I’m always addicted to Metanorn. IT ALL MAKES SENSE. I’m onto your plan now! KAWAII!! I want a Junko plushie!